lt;stronggt;ICE68058lt;/stronggt;lt;BR/gt;Iceberg OfficeWorks Mobile Training Tablelt;BR/gt;Functional, durable mobile training tables easily reconfigure to improve meeting productivity. Wear-resistant melamine top and perforated steel modesty panel. Strong, 1-1/2amp;quot; offset dual legs for maximum legroom. Easily mobile from room to room on 2amp;quot; diameter casters. 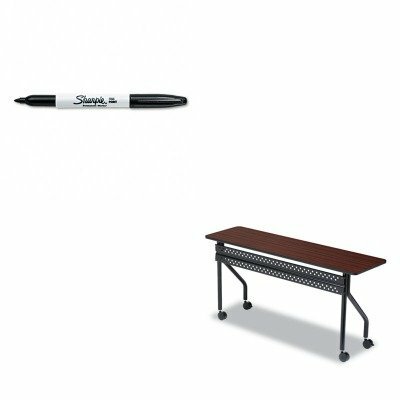 Top Color: Mahogany/Black Top Shape: Rectangular.lt;BR/gt;lt;BR/gt;lt;stronggt;SAN30001lt;/stronggt;lt;BR/gt;Iceberg OfficeWorks Mobile Training Tablelt;BR/gt;This fine tip permanent marker is the original Sharpie. Permanent on most hard-to-mark surfaces. Quick-drying ink is waterproof, smearproof and fade-resistant. Marker Type: Permanent Assortment: N/A Colors: Black Tip Type: Fine.